One of Wales’ top tourist attractions will launch a breathtaking new endurance challenge this summer. 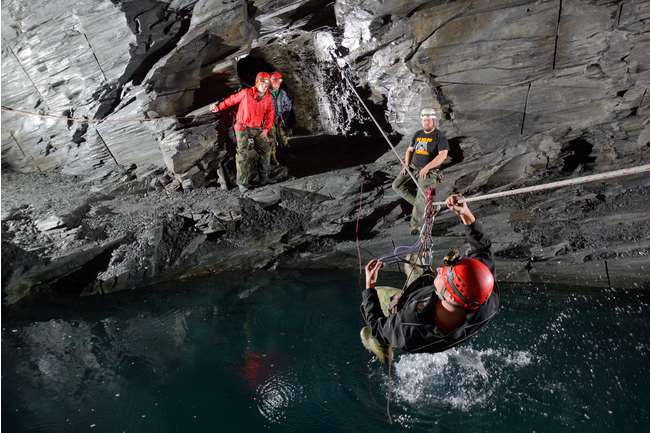 Mine to Mountain – the Ultimate Ascent is another groundbreaking world-first from the team at Go Below Underground Adventures in Betws y Coed. Directors Miles and Jennifer Moulding have designed a gripping 20-kilometre journey which takes thrillseekers from the deepest underground point in the UK to the summit of Snowdon, the highest mountain in England and Wales. It all begins 1,370 feet below the surface of Tanygrisiau at Cwmorthin – the largest slate mine in the world. Participants will then emerge from the mine and drive in convoy to Pen y Gwryd at the foot of Snowdon, before a 16km hike up and down the mountain. Miles believes the exclusive trek would be perfect for charity fundraisers and intrepid explorers. But you will have to be fit and capable, as the activity is expected to take between 12 and 14 hours. “This is something that’s never been done before, a challenge we’ve been looking at for a couple of years now,” said Miles. “Mine to Mountain will be a thrilling ascent, perfect for groups or individuals who want a unique experience or to raise money for charity. This latest development from comes as the couple announced plans to build a zipwire park at the disused former colliery in Gresford, Wrexham. These new additions to the Go Below activity group would complement their existing trips, with their maze of subterranean activities including the 130-metre Goliath, the world’s longest and deepest underground zip line and the world’s first underground freefall jump. The company was the first in North Wales to create an underground, adrenaline-fuelled experience and Jennifer says they have many more ideas in the pipeline. For now, though, the focus is firmly on Mine to Mountain. “At Go Below we are always looking to push people to their limits, and with this new challenge we’ve certainly done that,” said Jennifer. She added: “Mine to Mountain will be a deep and dark subterranean adventure like nothing anyone has seen before, emerging from the caves to take on the might of Snowdon. It will be a scintillating trip for everyone who takes part, both under the surface and above. For more information, visit www.go-below.co.uk or follow @gobelow on social media.